For Veteran's Day, I thought once again, to share a piece of family history. This portrait of my grandfather (c. 1940), is from his time in the Coast Guard. During the war, it was known as the 'domestic navy,' often charged with the duty of spotting U-boats off the coast, along with being the backbone of the international navy, by building the ships at Marcus Hook, an inlet near Philadelphia that leads to the Delaware Water Gap. Often times, at the end of the war, we realize the idiocy of what has happened. That may, among other things, lead to the realization that we've all been deceived by those who planted the seed in our minds to begin with. It is a rotten seed, full of lies, deceit and manipulation. My grandfather used to use the Yiddish term 'farshtunken,' which sounds, when compared to English, as if someone or something has been misunderstood, or 'mistaken.' But in Yiddish, the terms means that something smells putrid or rotten. Or, something that is utterly contemptible. As I often do on my blog, I tend to offer comparisons in music. For one, I think that music somehow has the tendency to relax the soul, in order to convey meaning through the sound and the lyrics that can help to release this kind of tension created by the order of things which led to the war. There is a German folktune that comes from long ago. Perhaps before the Crimean War called '99 luftballons.' This tune is similar to the sounds of Americana that people recognize in the music of Woody Guthrie, Bob Dylan and the Grateful Dead. In 1984, the tune was popularized by the band Nena, and again popularized in an American version by the same band. The song, as it was originally written was in protest to war. To the idiocy and the deception. The song relays an event in which a German air squadron was alerted of strange objects in the sky, 'UFOS' that baffled the minds of the pilots. The pilots shoot them down, only to realize they are nothing but children's balloons, but by the time they discover what they have done, a 99-year war begins, which never seems to come to an end. The modern meaning is still conveyed in Nena's popularized version. The song 'Fearless,' by Pink Floyd may represent a kind of afterthought. A scene from a protest, in which what was given in fear and in deception becomes clear, and the mirror is gone. I recently had the opportunity to be interviewed by Julie Carpenter, a film producer for the local television station here in Chandler. I talked about my work since 1994, and about some of the things that are influencing my work most recently. It was great to be able to vocalize some of the thoughts and processes in my work over the last twenty or so years. It's not something I typically do, and not something that I think that I'm particularly good at. But it's actually a good way to allow me to reflect upon my own work, by trying to say a little something about it to others. My mother died last night at 1:45 am. She was a remarkable woman who spent seventy-nine amazing years on this earth. I am thankful to her for my very existence, for carrying me in her womb for over nine months, for bringing me into this world, for raising me up to be the person that I am now. Lois Teresa Rosenfelt was born in Philadelphia, Pennsylvania, December 10, 1937. 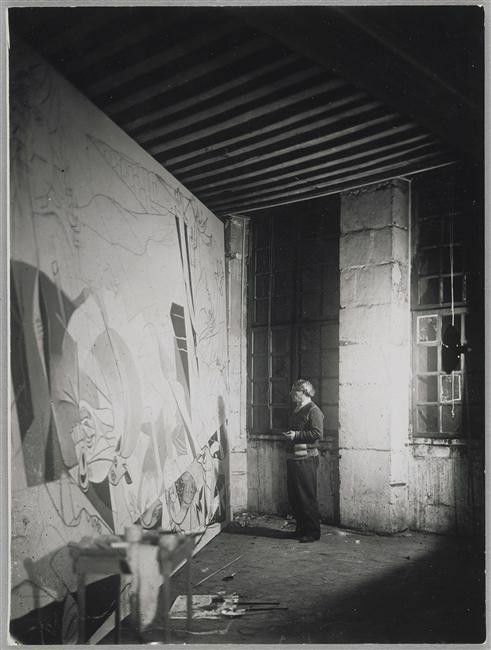 A famous photograph of Pablo Picasso comes to mind that is from that year, showing him in the process of painting Guernica in Nazi-occupied Paris, in what looks more like an abandoned building than a studio. My grandfather, William Rosenfelt was preparing to enter military service when his wife, my grandmother Ruth let him know that she was pregnant with my mom. My grandfather was excited and happily surprised, but because of the unexpected pregnancy, my grandmother forbade him to join the service. Instead, he decided on a domestic defense role with the Coast Guard, working off the coast of New Jersey, and building the naval ships at Marcus Hook, near Philadelphia. Soon thereafter, the Rosenfelt Family moved to Atlantic City, to be closer to my grandfather's post in the Coast Guard. Raised a Jew, my mother attended Hebrew School, which she admittedly didn't like, often making grim faces and commenting on the 'doom and gloom' of it all when I asked her about it. After the war, the family moved to Arden, Delaware, which was also closer to Marcus Hook. From what my mother told me, these seemed like the happiest days of her life. It was a small community, and she took part in a Shakespeare Festival that the community put together every year. She worked on set designs, and acted in the performances. When my mother was sixteen, she became unexpectedly pregnant, and her parents sent her to live in Philadelphia with family relatives. In 1953, she gave birth to her first child, a sister that I have never met, who was given up for immediate adoption upon birth. I didn't know this until today, the day that she died, when my dad told me. I had always heard my mom say things like 'I wish I could have given you a sibling to play with,' or 'do you ever wish you had a sister,' but I never knew what she actually meant by it. My lost sibling would now be sixty-four. I'd love to meet her if she is out there or if she reads this. After finishing high school in Philadelphia, my mom enrolled in art school at Tyler School of Art, which is part of Temple University. She told me about how much she loved creating work there, and about the senefelder stones that she used to make lithographs. It was around that time when my mother met her first husband, Jay Gerber, a Harvard business major. The wedding portrait at the beginning of this post is from that marriage. I think that my mother was happy about marrying someone financially successful, but his long European business trips, and comments that the prospect of children make him 'feel nauseous' put a strain on the relationship, and they eventually divorced. My mother then pursued a master's in education at Temple University, and after graduation took a job teaching high school art and social studies in Agoura Hills, near Los Angeles. While on sabbatical from teaching, my mother vacationed in Ensenada, Mexico, where she met my father, Jorge Badillo-Cochran. My father's father, an immigrant from San Francisco that settled in Ensenada when he couldn't find work during the war, had developed Lou Gehrig's disease, and died a year before I was born. Because of my grandfather's illness, my father became very interested in natural medicine, and introduced my mother to a diet that was new to the west called Macrobiotics. They began giving cooking classes in Ensenada and sold whole wheat empanadas for a living. Soon my mom was pregnant, and I was born, in a small yellow apartment, delivered by my father who had taken only one community college course in physiology, on September 22, 1978. My parents divorced when I was eight. My father remarried a woman named Jan, who was a beautiful and gentle stepmother that I loved dearly, but she soon developed cancer and died just over a year later. My mom went on to hold many kinds of jobs, including her own temporary services franchise. After I graduated high school, my mother moved to the mountains of Northern Arizona. She was always on the move, wanting to see new places, to travel and to explore. According to her, this was because she was a Sagittarius. We were always road-tripping. The majority of this country that I have seen is because of our trips together across country, down through the shimmering leaves of summer in the Blue Ridge mountains, to the pueblo of Acoma Sky City, to the mountains of Colorado. We kept moving. My mother was a free spirit. The last trip I went on with her was across country, from Philadelphia to San Francisco. But something was beginning to go wrong. The money from the $60,000 row home that she sold in Southwest Philadelphia was gone before we made it out to California. We struggled to find housing, and she finally rented a basement in South Oakland, and I ended up homeless on the streets of the Tenderloin District, until my father helped us to move down to Tucson. She was beginning to develop dementia. For years her illness progressed, from exhibiting confused, irrational and compulsive behavior, to living in squalor, to wandering out at night and getting lost. I received so many police calls, until it was finally time, with the help of adult protective services, to put her in a skilled nursing facility. Over twelve years she lived with Alzheimers—twelve long years when she was not the free spirit, the joyous, boisterous spirit that she once was. But I will always remember her as that person. I love my mother dearly. She was an amazing, giving person, who was always open with people. She was the type of person that people felt comfortable telling their life story to. She was an incredible human being, and I owe my very existence to her. I love you mom, forever. It's been forever since I've done a blog post. Our lives have been crazy, and are about to get even crazier as we await the birth of our third son, Theodore Francis. Elizabeth is due on Mother's Day, so we've been preparing the house. In the meantime, I thought to make soup. Why make soup when it's nearing 100° during the day here in Phoenix? I don't know, it just sounded good. And I had a lot of good organic vegetables to make it with. Put all of the ingredients in a baking pan, and broil on high, on the top rack for 20–25 minutes. Put the roasted vegetables in a blender or food processor. Add about 3 cups of chicken broth. I used Trader Joe's Free Range Chicken Broth, which is really good and rich, but you can use any kind you like. Cook in a large saucepan for another 15 minutes. Then melt about 2 tablespoons of butter. Good quality butter, any kind of butter in fact, is good for you, and contains healthy fats and selenium. ​Add 2 teaspoons of salt. Blend. Add Salt and Pepper to taste. This is great soup served with homemade croutons, crusty bread or a grilled sandwich. Enjoy! I was eleven when the Berlin Wall came down. I was fifteen when the demolition was finally complete. I was born in 1978, so my life, up until when I was in high school, was steeped in the stark reality of the Cold War. Since the end of World War II, and the development of the atomic bomb, the world felt itself on the brink of World War III, the next and final holocaust, the end of the world. I remember the evening news on most nights, covering the negotiations between Reagan and Gorbachev, as to whether or not to engage in nuclear war. Luckily, this ended in a peaceful agreement to begin to disarm short-range and mid-range ballistic missiles. But this didn't bring the situation to an end. The Berlin Wall was built in 1961, by the German Democratic Republic, the East German Regime. The motivation for building the wall was supposedly, like Trump's proposal for a wall between the US and Mexico, for protection. Protection, ironically, from imposing threats of fascism from socialist West Germany, and the NATO countries to the west. But this viewpoint, on behalf of the GDR, was their own form of propaganda. But Trump isn't the first president to build the wall. Obama also proposed it too, and actually completed a border fence along all 1,900 miles of the US southern border. It was also a hot topic during the Clinton administration. Like 11.7 million other immigrants in the US, I was also born south of the border. My mother, a US citizen born in Philadelphia, met my dad while on teacher's sabbatical in Baja California. They got married in the US, and my dad, and I, became naturalized citizens. On my mother's side, I am also the descendant of immigrants; my Jewish heritage comes from Bavaria and Russia. My mother was born in 1937, right in the middle of the holocaust (1933–1945). My grandmother forbade my grandfather to join the service, as she was pregnant with my mother. Instead he joined the coast guard, and worked in the naval yard at Marcus Hook building ships. Growing up in the eighties also meant being surrounded by the post-punk, post-war culture of the eighties. I grew up listening to Bauhaus, The Smiths, Joy Division (whose name makes reference to the Holocaust), and Pink Floyd. It was Pink Floyd in particular, that made a lot of very direct statements about the aftermath of World War II, and the "post-war dream," including The Wall, but also an album that was originally intended as the soundtrack for that film, called The Final Cut. Last year, Roger Waters played a concert at the Zócalo, in Mexico City, taking a critical stand against both the government of Mexico and the United States. With a new regime in our country, all of these Cold War memories, and post-war culture flooded my mind. Will Mexico become like East Berlin? Could we? The question, in light of America, land of the free, home of the brave, seems preposterous. But maybe such a possibility is not so far off. I think it's important to realize that these divisions, these conflicts, are caused, in comparison to a country's population, by only a handful of people. If we don't participate in their plans, don't head in the same direction, or simply disengage from their leadership, their words are just words. They have no effect. If politicians hold a rally, and nobody shows up, they'll eventually just go home. If they want a war, they can fight it themselves. On the other hand, if we participate in the midst of these conflicts, to help one another, and as Pope Francis recently said, to welcome refugees from other countries and religions, we can effectively counteract this separation, and this senseless division. I haven't posted in a while, because I've been painting a lot and writing my dissertation; not to mention taking care of the two little rascals during the day, while my wife is heroically changing catheters and bandaging wounds. So I thought I'd post a little about my dissertation research. The title of my dissertation is Geometry of the Sun: Guarino Guarini and the Church of San Lorenzo. It's about the baroque architect Guarino Guarini, and how this church he designed in Turin, called San Lorenzo, is connected to three principles in his theory of architecture: the art of building (edifizio), horology and gnomonics (orologia, gnomonica), and mechanics (macchinaria). The reason that these principles are significant to Guarini in particular, is because he was also a mathematician, an astronomer, a philosopher and a theologian. The first principle, of course, is architectural; the second two principles, pertain to astronomy, and particularly the sun. Horology is the measurement of time according to the movement of the sun, and gnomonics is the study of making sundials. Mechanics is mathematical, in a way that connects the architectural forms of the building to the mechanics, or the physics, of the solar system. So, my dissertation is built upon these three principles, that Guarini presents in his treatise on architecture, the Architettura Civile, and how these principles connect this church to a cosmology; to the universe around it in terms of its meaning and its design​. The religious historian Mircea Eliade wrote a lot about this idea of cosmology. He believed that there is a primordial desire in humankind to create sacred space; through a kind of religious hierophany, a break in the continuity of the universe occurs, which creates an "absolute reality," as opposed to the infinite emptiness which surrounds it. This break in continuity allows us to establish a center, a point of orientation, which has been known since antiquity as the axis mundi, or center of the world. And so, my theory about San Lorenzo, is that Guarini intended the church to represent this idea. The clearest example of this in the design of the church, is the interior of the dome (although the entire geometry of the church, in a very complicated way, reveals a lot of things about this universal kind of design). The dome of San Lorenzo is a complex interlacing of catenary curves, with large windows, and smaller fenestrations within the spaces between the catenaries. But when you look up at the dome, it also may seem similar to some designs that you've seen in Islamic mosque architecture. The catenaries above the smaller dome above the altar space, is also in the shape of the Star of David. Whether or not Guarini was intending to connect what are considered the "three great religions of the west" is not known for sure. But many of the advancements in early astronomy came about through Arabia as well, because of astronomers such as al-Kindi, al-Haytham, and al-Farabi. The other reason that the main dome has a lot to do with astronomy, is that it seems to be a model of something that Guarini writes about in several of his treatises, known as the celestial sphere. The pole at point D, is what goes through the center of the dome of San Lorenzo, and seems to point to the Zenith, which is the axis in the sky around which the stars revolve. The reason that this relates to time and the sun, as in the study of horology, is how it moves throughout the year around the dome, like a gigantic sundial. In my research, I am interested in whether or not the connection of Guarini's dome to the celestial sphere is cosmographic (meaning that it literally connects to the orientation of the zenith and the passage of the sun, thus really creating a kind of sundial), or if the meaning of San Lorenzo is more symbolic, theological, and cosmological. The human desire to orient ourselves within the universe is made manifest in some of the most ancient structures of the world, including the Pyramids of Giza, Stonehenge, the Roman Pantheon, and the Hogan of the Diné. By orienting ourselves, by finding out where we exist in the universe, we find out more about who we are. As the year comes to an end, and a new one begins, I thought to share some momentous occasions, some of our toughest tribulations, and what I've accomplished, both in the studio, and in my scholarly work. By far the best thing that happened this year: Elizabeth is due in May with our third baby. We are all excited about this new addition to the family! Griffin will turn four just a month prior, and he's definitely looking forward to having a new brother or sister. Elliot loves babies, and always wants to hold them whenever he sees one, or when we have friends over that have an infant. He got a doll for Christmas, from that new movie Moana that he takes care of as if it's his own. **[UPDATE] I guess the word is out, via my wife on Facebook, so I can reveal it here: We are having a boy, and his name will be Theodore Francis Badillo! Around the beginning of this year, my studio work changed quite drastically from where I was during the last three years. I've been calling this new period 'Neoclassical,' but I think that definitions of my work are always limiting. I wouldn't want to box myself in, and I think it all kind of makes sense in retrospect for some reason. Five or ten years down the line, it's all something to look back on. I think this may be particularly true for me, since so much of what I create is from memory, both in terms of the meaning of the work, as well as the technique. Many of these works take their influence from ancient Roman and Greek painting. In some of the work, I deliberately applied the paint to emulate the look of deteriorated frescoes and wall paintings from Rome and Pompeii. This year, I also completed my first sculpture in stone. A rather stoic study of Elizabeth in limestone. I really love working in this new medium. When I can afford it, I'm going to order marble instead of limestone, and a bit bigger piece perhaps. Something that was hard to deal with this year, was watching my mom deteriorate even further with Alzheimer's. She can't communicate verbally, she no longer walks, and she can't eat solid food. But I go visit her, and I hope she still knows me somehow. I love her, and she is my mother, and I know she still knows herself in there, and knows me and knows that people love her. The difficult part of seeing someone develop Alzheimer's, is that it's a long-term grieving process, since they live with it for so long. But it still feels good to go and touch her and hold her hand. My grandmother too, is in poor health, and may not be around too much longer either. Overall, it's been a great year. I'm very thankful to all of my family and friends. Beyond being a productive year in the studio, I also became ABD, and I have quite a draft in progress for my dissertation. I will also be showing two pieces in an upcoming museum exhibition at the Udinotti Museum here in Phoenix. As I look toward 2017, I see good things coming our way. The new baby, new art to make, a dissertation to finish, and to publish as my first book. Most of all, love for one another and for family, and to cherish the brief moments that we call life. Start with good olive oil in a large pot and turn it on. Dice the carrots and celery. Mince the garlic finely. Cut the acorn squash in half, remove seeds, and dice that too. Chop the Cavolo Nero. Add all of that to the pot, once the olive oil is hot. Cook until vegetables are soft, then add tomatoes and chicken broth. Bring to a boil. Then add 1 bag of Tortellini. Cook for another 25 minutes or so, until the tortellini is done, and the squash and the other vegetables are soft. Add salt and pepper to taste. There have been a lot of people coming out lately about their own problems with mental health. On October 10th, World Mental Health Day was recognized worldwide. The day was initially celebrated in 1992, by the World Federation of Mental Health, to educate, and to advocate against social stigma. The Duke and Duchess of Cambridge, and Prince Harry gave a speech on the subject and spoke at several other public events. Night/Weekend editor of Esquire magazine Sammie Nickalls is also a mental health advocate, that recently created the #TalkingAboutIt hashtag. So, because of all of this, I though I'd muster up the bravery to talk about my own struggles with mental health. When I was seventeen, I was diagnosed with a chronic illness known as Schizoaffective Disorder, which is characterized by symptoms of Schizophrenia, like hallucinations and delusions, and symptoms of a mood disorder, like mania or depression. This has been a great challenge for me in my life, but I didn't want to make this blog post only about my condition as an illness, but also about how it has affected me as a creative person. There have been many studies, such as in this article on Art and Mental Illness from the Stanford Journal of Neuroscience, that show a greater prevalence of mental illness among artists, writers, musicians and actors. I would say that even though I wasn't diagnosed with Schizoaffective Disorder until age seventeen, due to a major episode, I know that this is the way my brain has worked all along. ​I have always been a person who enjoys quietude. I am an introvert. In fact, I only score one point for extroversion on the Meyers Briggs. But this tendency goes beyond having a reserved personality. Throughout my life, I have felt isolated, alone, misunderstood. I've always been a very detached person. In high school, when I discovered black and white photography, I used it as an escape. Through the lens of my camera, the world stood still. It felt like I was truly able to see, for the very first time. But this feeling of isolation is sometimes connected to depression. Even when I am with friends, I have often felt alone somehow, and unable to express myself in a way that makes sense to most people. I have long felt an affinity with Vincent van Gogh. I am not sure that it is known as to what kind of mental illness he had, but I think that without the treatments that they have today, I would be very much in the same situation he was in. Without my medication, I also suffered from horrible episodes, hallucinations, and lack of self-worth. With treatment, I am much better—but my life has still been wrought with depression, periods of severe poverty, homelessness, and other related problems. The first symptom people often associate with Schizophrenia is hearing voices. But there is more to the auditory aspect of my illness than this. It's true, that sometimes it feels as if people are talking who aren't there, or almost as if my thought process separates into other people and becomes auditory. Sometimes the things people are saying in another room seems distorted, or I become really over-sensitized to noise—so much sometimes that I need to leave a party or a public event with a noisy crowd. But there is a creative flip-side to these symptoms. I have sat in a completely quiet room and listened to an entire violin concerto that, as far as I know, has never been played. I listen very carefully to music. Sometimes, when I've gone to a symphony or chamber music concert, I feel as if I can absorb every note. But when I leave, hearing a honking car in the street, or any other loud noise feels upsetting to my senses. I have been encouraged by friends who are composers to someday write music. Now that we will soon be getting a piano, I plan to do this. Robert Schumann and Dmitri Shostakovich also had experiences of musical hallucinations. ​For me, the depression part of my illness is exhausting. Coffee helps, it's true, and melancholia is not necessarily always bad—but sometimes the weight of depression is unbearable. It feels like a heavy burden on my soul. It feels sometimes like a struggle to keep going. In my work as an artist, I have found ways of fighting against this, of feeling stronger. Since last year, I've begun painting large figures. I had painted the figure in the past, but now they have more weight, solidity and mass than before. I always paint standing up, but more recently, and I think because of the depression, I feel as if standing strong, and painting the figure in a way that is strong, is a way of holding up my own weight, and even lifting the weight of the figures in the painting. My experiences with mania also have a lot to do with creativity. When I've been on a manic swing, I stop sleeping, and will work restlessly for hours, days and weeks on creative projects. The problem with this is twofold. First, even though I'm being super productive, I stop sleeping. Second, even though at first it seems as if my mind becomes more advanced, that I can do things that before were not possible, and that I can unravel complex philosophical mysteries in my academic writings, it slowly becomes apparent that I am starting to come apart at the seams. What was at first a brilliant vision plummets into a frightening and empty delusion. Although I have struggled with my mental health throughout my life, I have learned to see it as a gift. A blessing and not a curse. It is important for people to know that struggling with depression, for me anyway, is a completely different thing than unhappiness. I'm a happy person, with an abundant life, a beautiful wife and family, a budding art career, and so many things that I love to do and live for. But depression and Schizophrenia is an illness. When I battle with it, I feel sick, just like people get sick in other ways. I may not have a temperature, or feel nauseous, but when I suffer I feel ill, and I need to give myself time to rest, and to heal.